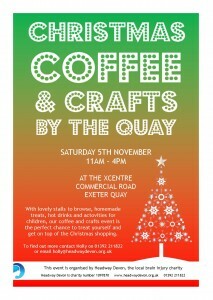 On Saturday 5th November our popular coffee and crafts event will be returning to the XCentre by Exeter Quay to help you kick-start your Christmas shopping. The event will see a range of talented local crafters and artists coming together in this stunning 17th century building by Exeter Quay to showcase and sell their beautiful items. Fundraising Manager, Holly Keatings, says, “with lots of local craft stalls to browse selling a huge range of beautiful items including art works, jewellery, homewares and wooden clocks, this event really does have something for everyone. The XCentre can be found on Commercial Road, by Exeter Quay. The fair will be open from 11am-4pm and entry is free. This event is organised in support of Headway Devon, the local brain injury charity. For more information contact Holly on 01392 211822.